A man has been taken to hospital suffering from hypothermia after his car went into Lough Neagh in Antrim. Police were called to Lough Road at 00:30 BST on Sunday and found the vehicle partially submerged. Four officers entered the water and pulled the man to safety. Police said "weather conditions were poor with high winds" at the time. 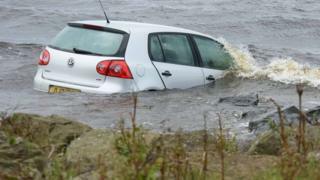 They added that the car had taken "in a substantial amount of water and was at risk of drifting further from the shore". PSNI Insp Claire Gilbert said she commended the "brave actions" of the officers in ensuring the man's safety. "The swift action of the police officers involved who, in treacherous conditions placed themselves at personal risk, were key to saving this man's life," she added.